JETERY water filter replacements have efficient filtration and longevity of use, and they are very easy to install. JETERY new filter technology bring a better experience for your drinking. JETERY adapts latest new filtration system in dual-layer carbon filtration to remove chlorine from your tap water ,delivering a greater tasting water without unpleasant odor and color. Generally, each replacement filter can be used for 2 months or 40 gallons. However, the water quality and the using frequency will affect the lifetime of replacement filter. 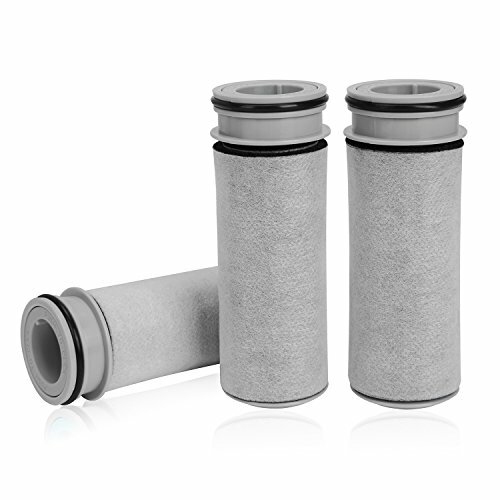 Dual-layer Filtration - JETERY replacement filters use double-layered carbon fiber cotton and non-woven cotton to filter water cleaner. They're 100% food grade materials to guarantee the safe water. Great Tasting - JETERY pitcher filter replacement can remove most of numerous potentially harmful contaminants,and make a cleaner great-tasting filtered water to protect you and your family. Compatible For - The pitcher replacement filters are guaranteed to fit Brita Stream pitcher, not original Brita filters, enjoy 3 BPA free JETERY replacement filters for always great-tasting, filtered water. Easy Installation - The replacement pitcher filters have designed the hold part and the click button for easier installation. You can change your filter easily and fast. If you have any questions about this product by JETERY, contact us by completing and submitting the form below. If you are looking for a specif part number, please include it with your message.